The program helps you to automate the processes of your organization. The program is designed for all types of associations. In spite of the complicated tasks of membership system, we have tried to make the program as simple and understandable as possible. The system has several ways to enter data quickly, such as hot-buttons, automate entering the information from a database, etc. The flexible and simple search function in the program database with various parameters simplifies the work considerably. The system allows you to store various information to the members: personal data (place of birth, date of birth), more contact information, more than one address, multiple photos, bank data. There are also a lot of special fields, such as trustee, insurance information or history of issued member ID cards. In the program it is very easy to see in which courses a member has logged in, what invoices were issued to him and what payments were received from him. A balance of the member is also showed. Courses have the following properties: name, description, category, beginning, end, hall, instructor, etc. 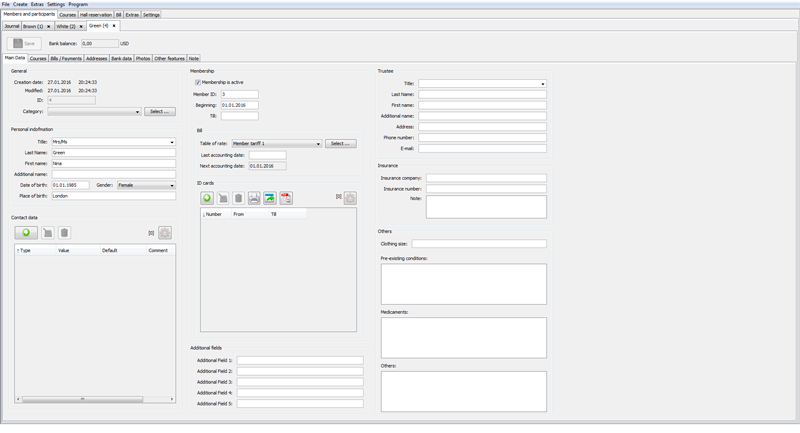 It is possible to assign a course participant and control availability. Courses can be written to a total invoice or any individual course can be billed. Each course will take place in a room. Rooms can be defined in settings. The program provides a graphical representation of the room occupancy. The system provides the management of member tariffs, automatic billing of members - automatic creation of bills before the start or after the end of the accounting period. From existing in the program accounts a SEPA direct debits can be created. These can be stored in an XML file and is used for automatic debiting of amounts in online banking. The selected accounts will be marked as "paid" and corresponding payments are generated. The program has different statistics and graphs, such as the number of active members or sum of invoices issued.